The sultans of the Ottoman Empire (Turkish: Osmanlı padişahları), who were all members of the Ottoman dynasty (House of Osman), ruled over the transcontinental empire from its perceived inception in 1299 to its dissolution in 1922. At its height, the Ottoman Empire spanned an area from Hungary in the north to Yemen in the south, and from Algeria in the west to Iraq in the east. Administered at first from the city of Söğüt since before 1280 and then from the city of Bursa since 1323 or 1324, the empire's capital was moved to Edirne in 1363 following its conquest by Murad I, and then to Constantinople (present-day Istanbul) in 1453 following its conquest by Mehmed II. Ottoman Empire in 1683, at the height of its territorial expansion in Europe. The Ottoman Empire's early years have been the subject of varying narratives due to the difficulty of discerning fact from legend. The empire came into existence at the end of the thirteenth century, and its first ruler (and the namesake of the Empire) was Osman I. According to later, often unreliable Ottoman tradition, Osman was a descendant of the Kayı tribe of the Oghuz Turks. The eponymous Ottoman dynasty he founded endured for six centuries through the reigns of 36 sultans. The Ottoman Empire disappeared as a result of the defeat of the Central Powers with whom it had allied itself during World War I. The partitioning of the Empire by the victorious Allies and the ensuing Turkish War of Independence led to the abolition of the sultanate in 1922 and the birth of the modern Republic of Turkey in 1922. The Ottoman Empire was an absolute monarchy during much of its existence. By the second half of the fifteenth century, the sultan sat at the apex of a hierarchical system and acted in political, military, judicial, social, and religious capacities under a variety of titles. [a] He was theoretically responsible only to God and God's law (the Islamic شریعت‎ şeriat, known in Arabic as شريعة sharia), of which he was the chief executor. His heavenly mandate was reflected in Islamic titles such as "shadow of God on Earth" (ظل الله في العالم‎ ẓıll Allāh fī'l-ʿalem) and "caliph of the face of the earth" (خلیفه روی زمین‎ Ḫalife-i rū-yi zemīn). All offices were filled by his authority, and every law was issued by him in the form of a decree called firman (فرمان‎). He was the supreme military commander and had the official title to all land. Osman (died 1323/4) son of Ertuğrul was the first ruler of the Ottoman state, which during his reign constituted a small principality (beylik) in the region of Bithynia on the frontier of the Byzantine Empire. After the conquest of Constantinople in 1453 by Mehmed II, Ottoman sultans came to regard themselves as the successors of the Roman Empire, hence their occasional use of the titles Caesar (قیصر‎ Qayser) of Rûm, and emperor, as well as the caliph of Islam. [b] Newly enthroned Ottoman rulers were girded with the Sword of Osman, an important ceremony that served as the equivalent of European monarchs' coronation. A non-girded sultan was not eligible to have his children included in the line of succession. Although absolute in theory and in principle, the sultan's powers were limited in practice. Political decisions had to take into account the opinions and attitudes of important members of the dynasty, the bureaucratic and military establishments, as well as religious leaders. Beginning in the last decades of the sixteenth century, the role of the Ottoman sultans in the government of the empire began to decrease, in a period known as the Transformation of the Ottoman Empire. Despite being barred from inheriting the throne, women of the Imperial Harem—especially the reigning sultan's mother, known as the Valide Sultan—also played an important behind-the-scenes political role, effectively ruling the empire during the period known as the Sultanate of Women. Constitutionalism was only established during the reign Abdul Hamid II, who thus became the empire's last absolute ruler and its reluctant first constitutional monarch. Although Abdul Hamid II abolished the parliament and the constitution to return to personal rule in 1878, he was again forced in 1908 to reinstall constitutionalism and was deposed. Since 2017, the head of the House of Osman has been Dündar Ali Osman, a great-grandson of Abdul Hamid II. The table below lists Ottoman sultans, as well as the last Ottoman caliph, in chronological order. The tughras were the calligraphic seals or signatures used by Ottoman sultans. They were displayed on all official documents as well as on coins, and were far more important in identifying a sultan than his portrait. The "Notes" column contains information on each sultan's parentage and fate. For earlier rulers, there is usually a time gap between the moment a sultan's reign ended and the moment his successor was enthroned. This is because the Ottomans in that era practiced what historian Quataert has described as "survival of the fittest, not eldest, son": when a sultan died, his sons had to fight each other for the throne until a victor emerged. Because of the infighting and numerous fratricides that occurred, a sultan's death date therefore did not always coincide with the accession date of his successor. In 1617, the law of succession changed from survival of the fittest to a system based on agnatic seniority (اکبریت‎ ekberiyet), whereby the throne went to the oldest male of the family. This in turn explains why from the 17th century onwards a deceased sultan was rarely succeeded by his own son, but usually by an uncle or brother. Agnatic seniority was retained until the abolition of the sultanate, despite unsuccessful attempts in the 19th century to replace it with primogeniture. Son of Ertuğrul Bey and an unknown woman. Son of Osman I and Malhun Hatun. Son of Orhan and Nilüfer Hatun. Killed on the battlefield at the Battle of Kosovo on June 15, 1389. Son of Murad I and Gülçiçek Hatun. Died in captivity in Akşehir on 8 March 1403. After the Battle of Ankara on July 20, 1402, İsa Çelebi defeated Musa Çelebi and began controlling the western part of Anatolian territory of the empire for approximately two years. Defeated by Mehmed Çelebi in the battle of Ulubat in 1405. Murdered on 17 February 1411. Acquired the title of The Sultan of Rumelia for the European portion of the empire on 18 February 1411, just after the death of Süleyman Çelebi. Killed on 5 July 1413 by Mehmed Çelebi’s forces in the battle of Çamurlu Derbent near Samokov in Bulgaria. Acquired the control of the eastern part of the Anatolian territory as the Co-Sultan just after the defeat of the Battle of Ankara on 20 July 1402. Defeated İsa Çelebi in the battle of Ulubat in 1405. Became the sole ruler of the Anatolian territory of the Ottoman Empire upon İsa’s death in 1406. Acquired the title of Ottoman Sultan Mehmed I Khan upon Musa’s death on 5 July 1413. Son of Bayezid I and Devlet Hatun. Abdicated of his own free will in favour of his son Mehmed II. Son of Murad II and Hüma Hatun. Surrendered the throne to his father after having asked him to return to power, along with rising threats from Janissaries. Son of Mehmed II and Gülbahar Hatun. Died near Didymoteicho on 26 May 1512. Son of Bayezid II and Gülbahar Hatun. Deposed due to his mental instability in favour of his young nephew Osman II. Murdered on 20 May 1622 by the Grand Vizier Kara Davud Pasha. Deposed due to his poor mental health and confined until his death in Istanbul on 20 January 1639. Son of Ahmed I and Kösem Sultan. Son of Abdulmejid I and Tirimüjgan Kadın and later the adoptive son of Perestu Kadın). Reigned as a figurehead of Mehmed Talat, İsmail Enver, and Ahmed Cemal Pashas until his death. a1 2 : The full style of the Ottoman ruler was complex, as it was composed of several titles and evolved over the centuries. The title of sultan was used continuously by all rulers almost from the beginning. However, because it was widespread in the Muslim world, the Ottomans quickly adopted variations of it to dissociate themselves from other Muslim rulers of lesser status. Murad I, the third Ottoman monarch, styled himself sultan-i azam (سلطان اعظم, the most exalted sultan) and hüdavendigar (خداوندگار, emperor), titles used by the Anatolian Seljuqs and the Mongol Ilkhanids respectively. His son Bayezid I adopted the style Sultan of Rûm, Rûm being an old Islamic name for the Roman Empire. The combining of the Islamic and Central Asian heritages of the Ottomans led to the adoption of the title that became the standard designation of the Ottoman ruler: Sultan [Name] Khan. Ironically, although the title of sultan is most often associated in the Western world with the Ottomans, people within Turkey generally use the title of padishah far more frequently when referring to rulers of the Ottoman Dynasty. b1 2 3 : The Ottoman Caliphate was one of the most important positions held by rulers of the Ottoman Dynasty. The caliphate symbolized their spiritual power, whereas the sultanate represented their temporal power. According to Ottoman historiography, Murad I adopted the title of caliph during his reign (1362 to 1389), and Selim I later strengthened the caliphal authority during his conquest of Egypt in 1516-1517. 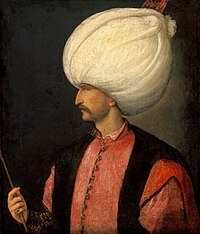 However, the general consensus among modern scholars is that Ottoman rulers had used the title of caliph before the conquest of Egypt, as early as during the reign of Murad I (1362–1389), who brought most of the Balkans under Ottoman rule and established the title of sultan in 1383. It is currently agreed that the caliphate "disappeared" for two-and-a-half centuries, before being revived with the Treaty of Küçük Kaynarca, signed between the Ottoman Empire and Catherine II of Russia in 1774. The treaty was highly symbolic, since it marked the first international recognition of the Ottomans' claim to the caliphate. Although the treaty made official the Ottoman Empire's loss of the Crimean Khanate, it acknowledged the Ottoman caliph's continuing religious authority over Muslims in Russia. From the 18th century onwards, Ottoman sultans increasingly emphasized their status as caliphs in order to stir Pan-Islamist sentiments among the empire's Muslims in the face of encroaching European imperialism. When World War I broke out, the sultan/caliph issued a call for jihad in 1914 against the Ottoman Empire's Allied enemies, unsuccessfully attempting to incite the subjects of the French, British and Russian empires to revolt. Abdul Hamid II was by far the Ottoman Sultan who made the most use of his caliphal position, and was recognized as Caliph by many Muslim heads of state, even as far away as Sumatra. He had his claim to the title inserted into the 1876 Constitution (Article 4). c1 2 : Tughras were used by 35 out of 36 Ottoman sultans, starting with Orhan in the 14th century, whose tughra has been found on two different documents. No tughra bearing the name of Osman I, the founder of the empire, has ever been discovered, although a coin with the inscription "Osman bin Ertuğrul" has been identified. Abdulmejid II, the last Ottoman Caliph, also lacked a tughra of his own, since he did not serve as head of state (that position being held by Mustafa Kemal, President of the newly founded Republic of Turkey) but as a religious and royal figurehead. d^ : The Ottoman Interregnum, also known as the Ottoman Triumvirate (Turkish: Fetret Devri), was a period of chaos in the Ottoman Empire which lasted from 1402 to 1413. It started following the defeat and capture of Bayezid I by the Turco-Mongol warlord Tamerlane at the Battle of Ankara, which was fought on 20 July 1402. Bayezid's sons fought each other for over a decade, until Mehmed I emerged as the undisputed victor in 1413.
e^ : The dissolution of the Ottoman Empire was a gradual process which started with the abolition of the sultanate and ended with that of the caliphate 16 months later. The sultanate was formally abolished on 1 November 1922. Sultan Mehmed VI fled to Malta on 17 November aboard the British warship Malaya. This event marked the end of the Ottoman Dynasty, not of the Ottoman State nor of the Ottoman Caliphate. On 18 November, the Grand National Assembly (TBMM) elected Mehmed VI's cousin Abdulmejid II, the then crown prince, as caliph. The official end of the Ottoman State was declared through the Treaty of Lausanne (24 July 1923), which recognized the new "Ankara government," and not the old Istanbul-based Ottoman government, as representing the rightful owner and successor state. The Republic of Turkey was proclaimed by the TBMM on 29 October 1923, with Mustafa Kemal as its first President. Although Abdulmejid II was a figurehead lacking any political power, he remained in his position of Caliph until the office of the Caliphate was abolished by the TBMM on 3 March 1924. Mehmed VI later tried unsuccessfully to reinstall himself as caliph in the Hejaz. Lindner, Rudi Paul (1983). Nomads and Ottomans in Medieval Anatolia. Indiana University Press. p. 10. In fact, no matter how one were to try, the sources simply do not allow the recovery of a family tree linking the antecedents of Osman to the Kayı of the Oğuz tribe. Without a proven genealogy, or even without evidence of sufficient care to produce a single genealogy to be presented to all the court chroniclers, there obviously could be no tribe; thus, the tribe was not a factor in early Ottoman history. ^ a b Glazer 1996, "Ottoman Institutions"
^ Peirce, Leslie. "The sultanate of women". Channel 4. Archived from the original on 2007-12-03. Retrieved 2009-04-18. ^ "Son Osmanli vefat etti! (English: Last Ottoman died!)" (in Turkish). September 24, 2009. Retrieved 19 February 2010. ^ Finkel, Caroline (2007). Osman's dream : the history of the ottoman empire. Basic Books. p. 555. ISBN 9780465008506. ^ a b Kafadar, Cemal (1995). Between Two Worlds: The Construction of the Ottoman State. pp. 60, 122. ^ a b c d e f g h Lowry, Heath (2003). The Nature of the Early Ottoman State. SUNY Press. p. 153. ^ "Sultan Orhan Gazi". Republic of Turkey Ministry of Culture and Tourism. Retrieved 2009-02-06. ^ "Sultan Murad Hüdavendigar Han". Republic of Turkey Ministry of Culture and Tourism. Retrieved 2009-02-06. ^ "Sultan Yıldırım Beyezid Han". Republic of Turkey Ministry of Culture and Tourism. Retrieved 2009-02-06. ^ Joseph von Hammer: Osmanlı Tarihi cilt I (condensation: Abdülkadir Karahan), Milliyet yayınları, İstanbul. p 58-60. ^ Joseph von Hammer: Osmanlı Tarihi cilt I (condensation: Abdülkadir Karahan), Milliyet yayınları, İstanbul. p. 58-60. ^ "Sultan Mehmed Çelebi Han". Republic of Turkey Ministry of Culture and Tourism. Retrieved 2009-02-06. ^ a b "Chronology: Sultan II. Murad Han". Republic of Turkey Ministry of Culture and Tourism. Retrieved 2009-04-07. ^ "Chronology: Fatih Sultan Mehmed Han". Republic of Turkey Ministry of Culture and Tourism. Retrieved 2010-07-15. ^ "Sultan II. Bayezid Han". Republic of Turkey Ministry of Culture and Tourism. Retrieved 2009-02-06. ^ a b "Sultan VI. Mehmed Vahdettin Han". Republic of Turkey Ministry of Culture and Tourism. Retrieved 2009-02-06. ^ M'Gregor, J. (July 1854). "The Race, Religions, and Government of the Ottoman Empire". The Eclectic Magazine of Foreign Literature, Science, and Art. Vol. 32. New York: Leavitt, Trow, & Co. p. 376. OCLC 6298914. Retrieved 2009-04-25. ^ Glassé, Cyril, ed. (2003). "Ottomans". The New Encyclopedia of Islam. Walnut Creek, CA: AltaMira Press. pp. 349–351. ISBN 978-0-7591-0190-6. OCLC 52611080. Retrieved 2009-05-02. ^ Mensiz, Ercan. "About Tugra". Tugra.org. Archived from the original on 2007-10-25. Retrieved 2009-02-06. ^ Steffen, Dirk (2005). "Mehmed VI, Sultan". In Tucker, Spencer. World War I: Encyclopedia. Volume. III: M–R. Santa Barbara, CA: ABC-CLIO. p. 779. ISBN 978-1-85109-420-2. OCLC 162287003. Retrieved 2009-05-02. As̜iroğlu, Orhan Gâzi (1992). Son halife, Abdülmecid. Tarihin şahitleri dizisi (in Turkish). Istanbul: Burak Yayınevi. ISBN 978-9757645177. OCLC 32085609. Duran, Tülay (1999). Padişah Portreleri (Portraits of the Ottoman Empire's Sultans) (in Turkish). Sirkeci: Association of Historical Research and Istanbul Research Centre. ISBN 978-9756926079. OCLC 248496159. Findley, Carter V. (2005). The Turks in World History. New York: Oxford University Press US. ISBN 978-0-19-517726-8. OCLC 54529318. Retrieved 2009-04-29. Glazer, Steven A. (1996) [Research completed January 1995]. "Chapter 1: Historical Setting". In Metz, Helen Chapin. A Country Study: Turkey. Country Studies (5th ed.). Washington, D.C.: Federal Research Division of the Library of Congress. ISBN 978-0-8444-0864-4. OCLC 33898522. Retrieved 2009-04-22. Kafadar, Cemal (1996). Between Two Worlds: The Construction of the Ottoman State. Berkeley, CA: University of California Press. ISBN 978-0-520-20600-7. OCLC 55849447. Retrieved 2009-04-18. Karateke, Hakan T. (2005). "Who is the Next Ottoman Sultan? Attempts to Change the Rule of Succession during the Nineteenth Century". In Weismann, Itzchak; Zachs, Fruma. Ottoman Reform and Muslim Regeneration: Studies in Honour of Butrus Abu-Manneb. London: I. B. Tauris. ISBN 978-1-85043-757-4. OCLC 60416792. Retrieved 2009-05-02. Peirce, Leslie P. (1993). The Imperial Harem: Women and Sovereignty in the Ottoman Empire. New York: Oxford University Press US. ISBN 978-0-19-508677-5. OCLC 243767445. Retrieved 2009-04-19. Quataert, Donald (2005). The Ottoman Empire, 1700–1922 (2nd ed.). Cambridge University Press. ISBN 978-0-521-83910-5. OCLC 59280221. Retrieved 2009-04-18. Stavrides, Theoharis (2001). The Sultan of Vezirs: The Life and Times of the Ottoman Grand Vezir Mahmud Pasha Angelović (1453–1474). Leiden: Brill Publishers. ISBN 978-90-04-12106-5. OCLC 46640850. Retrieved 2009-04-18. Sugar, Peter F. (1993). Southeastern Europe under Ottoman Rule, 1354–1804 (3rd ed.). Seattle: University of Washington Press. ISBN 978-0-295-96033-3. OCLC 34219399. Retrieved 2009-04-18. Toprak, Binnaz (1981). Islam and Political Development in Turkey. Leiden: Brill Publishers. ISBN 978-90-04-06471-3. OCLC 8258992. Retrieved 2009-04-19. Uğur, Ali (2007). Mavi Emperyalizm [Blue Imperialism] (in Turkish). Istanbul: Çatı Publishing. ISBN 978-975-8845-87-3. OCLC 221203375. Retrieved 2009-04-19. Toynbee, Arnold J. (1974). "The Ottoman Empire's Place in World History". In Karpat, Kemal H. The Ottoman State and Its Place in World History. Social, Economic and Political Studies of the Middle East. 11. Leiden: Brill Publishers. ISBN 978-90-04-03945-2. OCLC 1318483. Retrieved 2009-05-02. "Website of the 700th Anniversary of the Ottoman Empire". Retrieved 2009-02-06. "Official website of the immediate living descendants of the Ottoman Dynasty". Retrieved 2009-02-06.